Our Tim’s first impressions of Doom from QuakeCon 2014 were that it’s gory. Players can rip open a demon’s jaws, or shoot all of its extraneous bits off until its torso looks like a wine gum. It’s fair to say that id have reclaimed the gib-factor that Brutal Doom made its headline feature. But it’s worth remembering that the mod doesn’t just throw an extra pint of blood over an already-reddened engine. 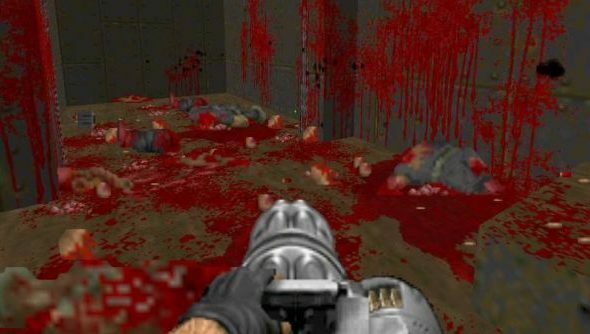 Rather, it imbues Doom 1 with some of the qualities modern developers would describe as visceral – though modder Sergeant Mark IV spends more time talking about actual viscera. Watch a 15-minute, work-in-progress demo of Brutal Doom’s most recent version below. The map pack used in this Brutal Doom demo is named Recurring Nightmare. But it’s doubtful whether any human subconscious could maintain a reasonable framerate with the sheer volume of gore, guts and – lest we forget – gibs flying across the screen here. In the meantime, you can download Brutal Doom v19 over at ModDB. Think you’ll paint Mars red again for this new release?